Published: Nov. 4, 2016 at 07:44 a.m.
NFL scouts know where they need to be each year in early November -- wherever Alabama and LSU are battling. The Tide and Tigers have produced the most NFL draft picks in the nation since 2010 (Alabama: 51, LSU: 44), including stars like receivers Julio Jones (Alabama) and Odell Beckham, Jr. (LSU). This weekend's renewal of the rivalry will have no shortage of future NFL stars. In addition to the top 10 players I list below who have a chance to be household names in the pros, I could write two more top-10 lists of other players who will play on Sundays. These are the best of the best who will take the field when the two teams meet on Saturday (8 p.m. ET, CBS). 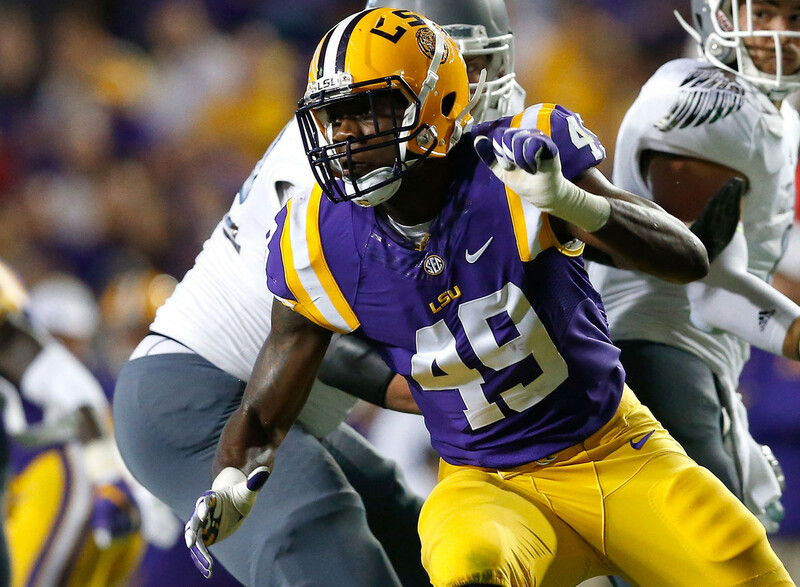 The Tigers' 6-6, 238-pound edge defender will be compared to former LSU end Barkevious Mingo, who never panned out in Cleveland after being selected sixth overall in 2013 (and hasn't done much with New England after it traded for him before the season). Key lacks the lower-body strength scouts would like to see from an elite prospect, but he's able to play with violent hands to shed his man. His get-off is one of the smoothest and quickest in college football. He puts tackles on the defensive after the ball is snapped. If Key continues to build leg strength and show flexibility to make plays on the outside, NFL teams will see great potential as a stand-up rusher. An athletic middle linebacker, Foster should be able to play in any defensive system in the pros. His heady play and willingness to be physical between the tackles should lead NFL coaches to trust him to make the calls and pre-play adjustments. There's no reason to think Foster won't be leading a defense for a long time. In today's NFL, cornerbacks need to be physical and confident; Humphrey has no issues there. The son of a former NFL running back, he can excel in zone or man-to-man coverage. When Tide offensive coordinator Lane Kiffin dials up a play for Howard, you get to see his athleticism in action. He runs like a big receiver at 6-foot-6, 250 pounds, but he's difficult to bring down in the open field and gives effort as a blocker. If Howard lands in the right situation, his new team will utilize him to the fullest -- in the red zone, down the seam, or moving the chains. That means big numbers. Forget about Ridley's stats (53-504-5). He's not in an Air Raid system, so his numbers won't be in line with those racked up by other college receivers. Ridley has all of the tools, however, to be an Antonio Brown-type receiver at the next level. Sinewy-strong with excellent leaping ability, Ridley also might have the best body control of any receiver in college football. He wins downfield despite his average height (6-1), and has the speed and agility to make defenders look foolish. With that sort of all-around skill set, there's no reason to doubt Ridley will be a No. 1 option in the NFL. Williams' ability to attack quarterbacks will be highly coveted, and players who have that ability are often drafted earlier than what was initially expected (see Dante Fowler, Leonard Floyd). General managers will expect him to have a more complete game by Year Two or Three of being a full-time professional with NFL coaching and conditioning, making him a potential star off the edge. Robinson's a wall on the left side of the offensive line. Forget trying to bull your way through him, and good luck defeating his block when he's coming off the ball in the run game. Some scouts will say his feet are too heavy, and he might struggle as a rookie if he tries to beat secondary moves from better pass rushers. But eventually, Robinson will refine his technique to the point where he settles in as a perennial Pro Bowl candidate. Adams, the Tigers' defensive leader, is able to do everything an NFL scout would like to see from a safety. He can play deep or in the box, he's a strong tackler and has good ball skills. Adams can be an enforcer, as well as take on tight ends in coverage. NFL teams need players like him, especially when facing high-tempo and versatile offenses. Substitutions are scarce in those situations, so everyone on defense has to handle multiple roles. Allen, a senior, is one of the top prospects for the 2017 NFL Draft. Texas A&M's young offensive linemen found out a couple of weeks ago what it's like to face the strong hands and quickness of Allen all day long. Add in hustle and instincts, and it's tough to take your eyes off of him, even with all of the other talented players on Nick Saban's defense. Whether he plays a Geno Atkins-type role in a four-man front or a five-technique spot like Green Bay's Mike Daniels, Allen will be a beast at the next level. It's hard to come up with a comparable talent for Fournette because of his elite combination of speed, size and strength. When he's healthy and the offensive line is doing its job, the former No. 1 high school recruit in the nation has all of the tools to be great. And if you think he's unwilling to be a physical pass protector for his quarterback, then you'd be wrong. Of course, keeping a running back healthy in the NFL, even a big, strong runner like Fournette, is extremely difficult. Still, NFL teams will be very excited about Fournette's potential whenever he enters the league -- even if Alabama's defense loads the box and controls LSU's offensive line Saturday, as it did last year, limiting Fournette to 31 yards on 19 carries.